This sugar free lemonade is sweetened with pineapple, and tastes just like regular lemonade but skips the refined sugar. Add ginger or mint to taste. 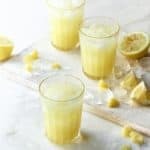 This sugar free lemonade from the 7-Day Raw Cleanse is sweetened with pineapple, and tastes just like conventional lemonade without the refined sugar. We’ve been blending up a lot of this sugar-free lemonade this summer, because it’s delicious, so refreshing in the hot weather, and is much healthier than the ubiquitous sugar-laden lemonades. This energizing, immune-boosting lemonade is a sensational sip during a cleanse. Amped up with vitamin C, lemon juice is an immunity idol that neutralizes acidic wastes, while citric acid stimulates enzymes and dissolves oxalates to aid digestion. Armed with an arsenal of alkaline buffer minerals and B vitamins, this citrus star also strengthens fat-metabolizing enzymes in the liver, flushes toxins from the blood, calms inflammation, builds collagen, and maintains healthy mucus membranes. Pineapple is a brilliant natural sweetener for lemonade. Containing manganese, thiamine (B1), and bromelain, pineapple aids energy production. Bromelain helps the vitamin C in lemon to suppress coughs, loosen mucus, flush out toxins, reduce swelling and bloating, and stimulate circulation. Ginger not only adds a great back-end kick, it contains natural antibiotic agents to fight infections. The gingerol calms inflammation to relieve pain and swelling, and stimulates the lymphatic system to help sweat out toxins. Ginger can also help settle the stomach, and alleviate nausea, gas, and bloating. One thing to note about this lemonade is that pineapple gets frothy when you blend it. Simply transfer the lemonade to a container and chill in the fridge for a few hours and the suds will settle. This lemonade is part of The 7-Day Raw Cleanse I created with Karen Kipp for Daily OM. This is a 7-day raw reset program, and all of the recipes are vegan (dairy-free, egg-free), gluten-free, grain-free, refined sugar-free & low in natural sugar, low-carb (non-starchy vegetables), soy-free, legume-free, corn-free, paleo-friendly, and nightshade-free (no tomatoes, peppers, eggplant, or potatoes). The best part about this program is that you get to experience the cleanse in a way that feels comfortable depending on your needs, lifestyle, and wellbeing. 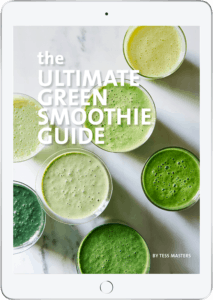 You can choose from two options: The Gentle Cleanse: 7 days of clean eating with juicing or The Deep-Dive Detox: 4 days of clean eating and 3 days of juice fasting. Participants in our cleanses report results such as: more energy, better sleep, strengthened immunity, improved digestion, clearer sinus passages, greater mental clarity, glowing skin, hair, and nails, and weight loss. 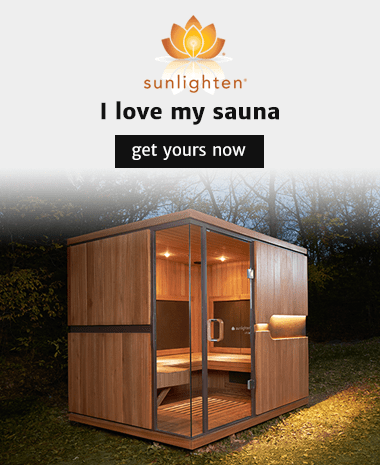 You can check it out Check out at Daily OM. Give this lemonade a try, and let me know what you think. Join the 7-Day Raw Cleanse. 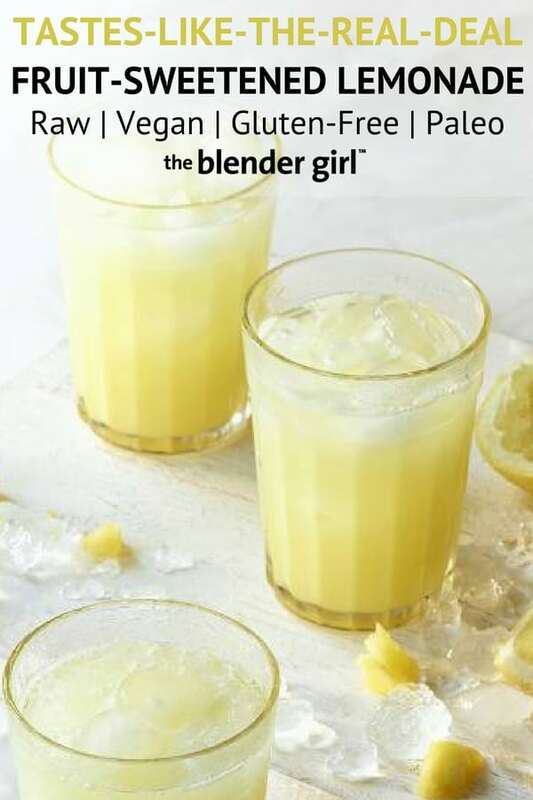 This sugar free lemonade is sweetened with pineapple, and tastes just like conventional lemonade without the refined sugar. Add ginger or mint to taste. Throw all of the ingredients into your blender, and blast on high for 30 to 60 seconds until pulverized. Strain the mixture through a fine mesh sieve or filtration bag. Tweak stevia to taste, and chill in the fridge. Add stevia to taste depending on the ripeness of your pineapple.